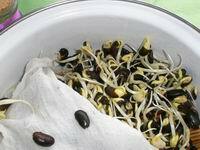 How to grow bean sprout? 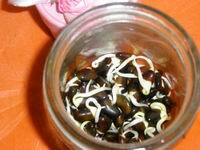 Growing bean sprout at home is not difficult, as long as you remember three things: temperature, light, diligence (changing water frequently). Home made bean sprout is healthy. What you need is a closed case, good bean seeds, and water. 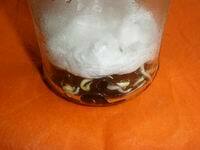 Giving these seeds a warm, dark-light and damp environment, they'll grow very fast. Go to the market to buy beans. 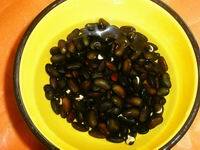 The best bean seeds should be last year's new seeds. They are easy to germinate. Some seeds in the market may be from two or three years. Please note, when I talking about bean seeds, it's the same meaning with what we usually call "beans". Beans themselves are seeds. That's why most experts recommend us to eat more beans as they have life. As long as given some water and under certain temperature and humidity they can grow. Prepare a case such as a jar, or a basin, or an unused pot.Soak bean seeds overnight, or till most of their peels break (meaning "we're going to come out":)). Fresh mung bean seeds only need one night. Soybean and black bean may need longer time. Using warm water. Take out beans which floated on the surface. These beans are dead, no life. Spread soaked bean seeds on the bottom of the case. Prepare a piece of gauze or a new tower, getting wet by warm water. Cover on the surface of the seeds. Put the case in a warm (around 20 centigrade, or 68 Farhenheit),low light place. Avoid full light. Bean seeds will grow into leaves under full light. Change water at least two times each day. Wash and pour out water. 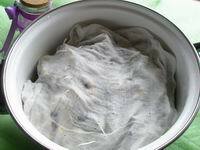 Keep bean seeds warm and damp. Note: using warm water. Three or four days later you'll be surprised to find that the buds is coming out. Only by water, how miracle of the life! If you want the sprouts thick you can put a light-heavy stone on the gauze/tower. But don't use too heavy stone. You might kill the life. When the sprouts grow to about one inch it's the time when the bean sprouts contain more vitamin C than any other moments, the longer, the less. You have your home made bean sprouts now. The next step is how to cook them.